In order to qualify for this Gift With Purchase, you need to make two Clinique purchases (one to be either skincare or foundation) and if you buy a third Clinique product, you will receive a full size Deep Comfort Hand and Cuticle Cream. Now on to the contents of the gift! 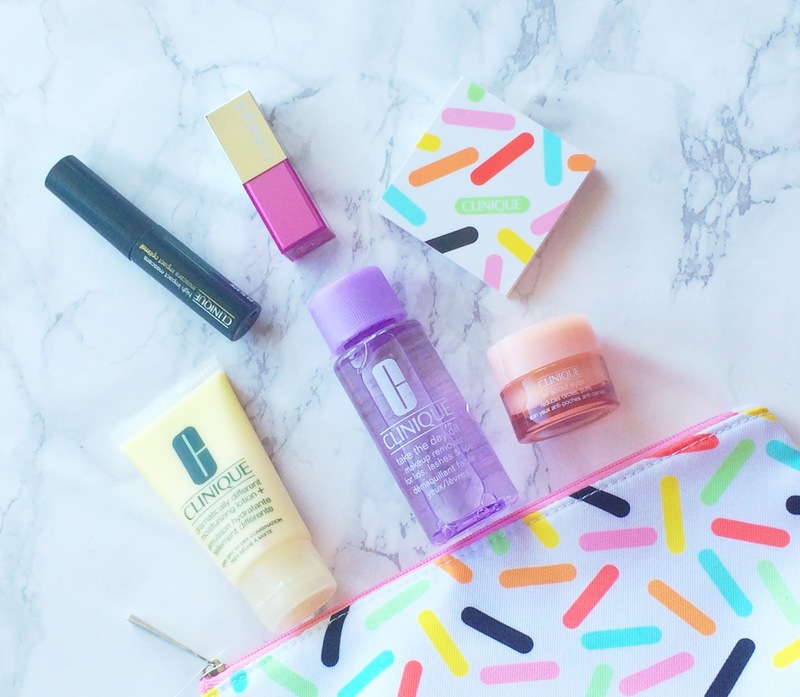 First up is a good sized make-up bag with a pretty confetti print and inside are 6 products - 3 skincare and 3 makeup. The first product to catch my eye was the bottle of Clinique Take The Day Off Makeup Remover Lids, Lashes & Lips. 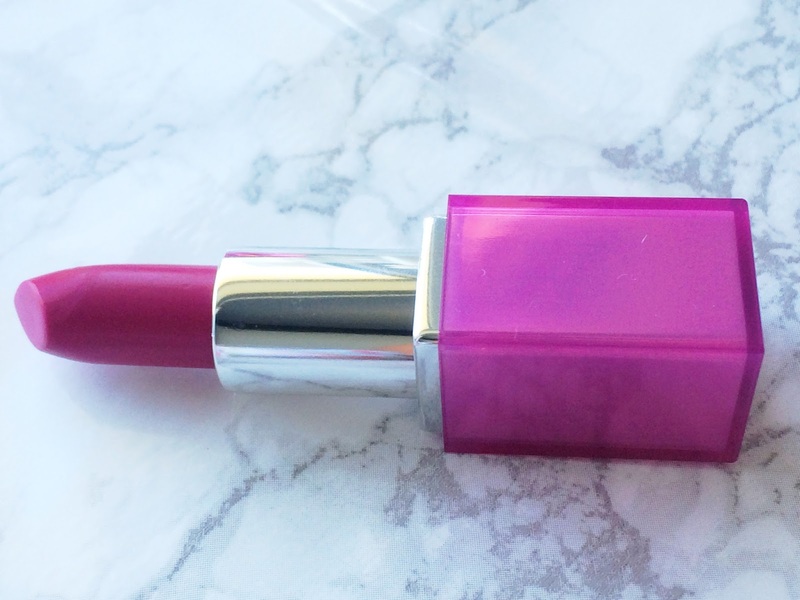 I've used this before and it is excellent at removing heavy eye makeup in one swipe and I find it particularly good for removing any remaining bold lip colours, especially liquid lipsticks, which can be difficult to remove. It is extremely gentle so is suitable for even sensitive eyes. I love how convenient the 50ml bottle is because it is perfect for travel. Next up is a real Clinique classic - Dramatically Different Moisturizing Lotion+, which comes in a very generous 30ml tube. I actually find that the Lotion+ version suits my dry skin more than the cream version of this moisturiser so I was delighted to see this tube in there. This is a very gentle, yet effective moisturiser and is a cult product for a reason! The final skincare item is All About Eyes Eye Cream. I have tried a few Clinique eye creams and have loved them (their Repair Wear Laser Focus and Smart Custom Eye Treatment are two of my favourites!) but before receiving this, I had never tried it. I find that is perfect for my morning skincare routine as it is light in texture and feels very refreshing on the eye area and isn't greasy so I don't need to worry about it breaking down any make-up that is applied over it. It is a very generous 7ml pot, which should last around 6/7 weeks. Now on to the make-up products and the product that I was most excited to see in there was a Pop Sheer Glaze Lip Colour and Primer in the shade Sprinkle Pop. I am a massive fab of the original Lip Pop formula and I ended up buying 7 shades last year when they were released so I was curious to see if this formula would live up to my expectations and, thankfully, it does. The colour is obviously not as pigmented as with the original formula, which the name suggests, but it is equally as comfortable to wear and lasts around 4 hours on me before it needs re-applying, and this colour is perfect for everyday wear as it is similar to MAC Syrup. This will be a handbag staple for me this Autumn. I love to take mini mascaras on holiday with me so was delighted to see a small tube of High Impact Mascara in the bag. I wouldn't describe this as giving the most voluminous lashes but it does add a small amount of volume and definition. Finally, there is a limited edition palette with the same packaging as the makeup bag and inside there are two eye shadows and a blush as well as a good sized mirror. The soft pink is perfect for an easy wash of colour on no-fuss makeup days and the charcoal can be used to add some definition along the lash line. 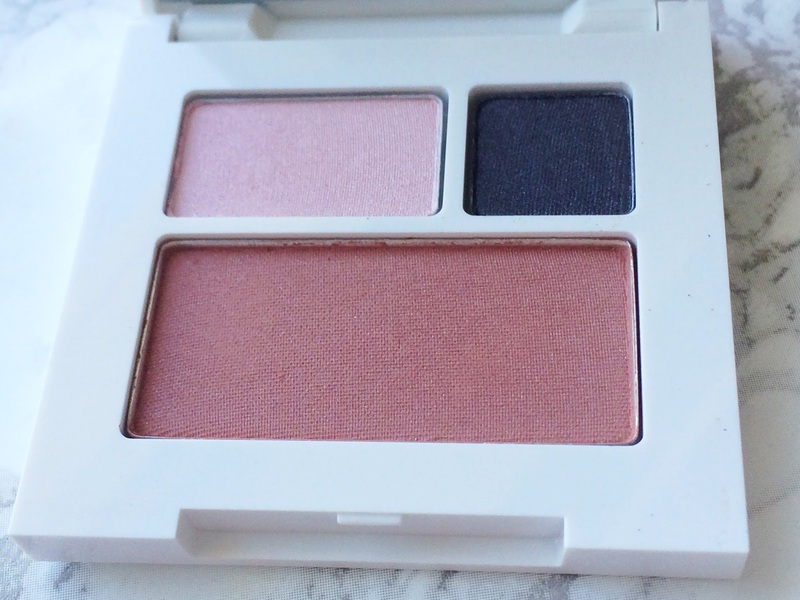 The mini Bashful Blush is a very pretty Autumnal colour, which adds a healthy glow to the cheeks. It is very finely milled, deceptively pigmented and wear time is a good 7-8 hours on me. I really like it and it has made me realise that I should try some more Clinique blushes. Overall, I think this is, yet again, an excellent gift with purchase from Clinique. It will be available both online and in Debenhams stores from October 6th-22nd, while stocks last. You can check this offer out in the UK here or in Ireland here. Tell me, do you like this type of promotion? Have you ever made any long-term love discoveries through gift with purchase offers? Are you tempted by this one? I'd love to hear your thoughts in the comments below!